Hearing the words 'Tanzania' or 'The Serengeti' or 'The Masai Mara' or 'Ngorongoro Crater' has always conjured up images in my mind from the books I have read or the countless nature documentaries I've seen. Sweeping plains, harsh sun, lions, wildebeest stampedes. Herds of zebra, elephants, Masai warriors, hyena's. Essentially east Africa is a photographers dream destination and one that most want to cross off their list. I was fortunate enough to do so myself recently when I visited Kenya's Masai Mara. It was everything I expected and more. My time in Kenya was only to be short so in order to make the most of it there was no question about who I should arrange my tour with. I have traveled with Shem Compion and C4 Images and Safari's before (to Botswana in 2011) so the choice was easy. Shem was to be the guide on this tour along with another experienced South African photographer Albie Venter. Both great guys and full of enthusiasm and knowledge of Africa and photography . This particular trip was a small group tour with only five participants including myself so we all had plenty of space in the safari's vehicles for getting into 'shot position' and spreading out camera gear. The location for our stay was the intimate and basic (but very comfortable) Entim Private Camp. This is a tented lodge with helpful staff, fine food, comfortable beds and a studio tent that included computers and a projection screen for nightly learning sessions. It has basically been set up with the needs of photographers in mind. Surely there is no better base in the Mara for a wildlife photography safari? 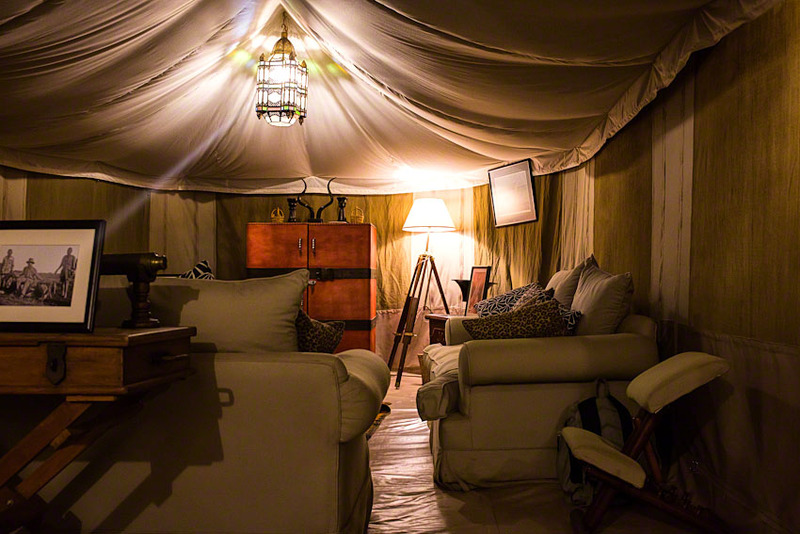 The main lounge tent at Entim Camp. Our first wildlife experience took us by surprise on the day of our arrival - even before we had departed on our first game drive. Entim camp is situated only a few minutes walk (or run) from the Mara River and one of its crossing points. We got word from one of the camp staff that there were Wildebeest about to make a crossing so we snatched up our gear and sprinted to the crossing in time to get about of ten minutes of rapid-fire photography in before the herd dispersed. Some animals turned back, some crossed in the typically confused fashion of river crossings. It was an exciting way to start and set the tone for an action safari. Over the next few days we saw hyena's on kills, giraffe, wildebeest, zebra, cheetah, serval, elephant, buffalo just to name some of the main ones. Oh, and lions. Lots of lions. In fact by the third day we had so many lion pixels on our memory cards we were starting to wonder if we would get bored with them. Lions sleeping and resting was the usual fare of course but there were also lion cubs, active young nomad males in golden morning light and an aborted hunt. Our early morning game drives started just as it was getting light and one morning we were informed that a big pride male had looked into the camp at the staff who were standing around the fire, cut through the service tents and circled back around the camp in pursuit of a female. We found both pride males about two hundred metres away as the first rays of light speared over the ridge into the small clearing where they were resting up. One of them shortly continued his pursuit of the female and they met a few minutes later. We were able to shoot them while they were mating in lovely light for a while before heading off on the rest of the game drive. They stayed in this area (right next to the camp remember) for the next day and a half so we visited them twice more at the beginning and end of our game drives. The sound of lions roaring in the night is never forgotten. Cheetah were notably absent for the first three days then we had multiple sightings of three recently abandoned cheetah siblings who were making a go of it on their own for the first time. In three days we saw them on four hunts, one of which resulted in an impala foal kill. 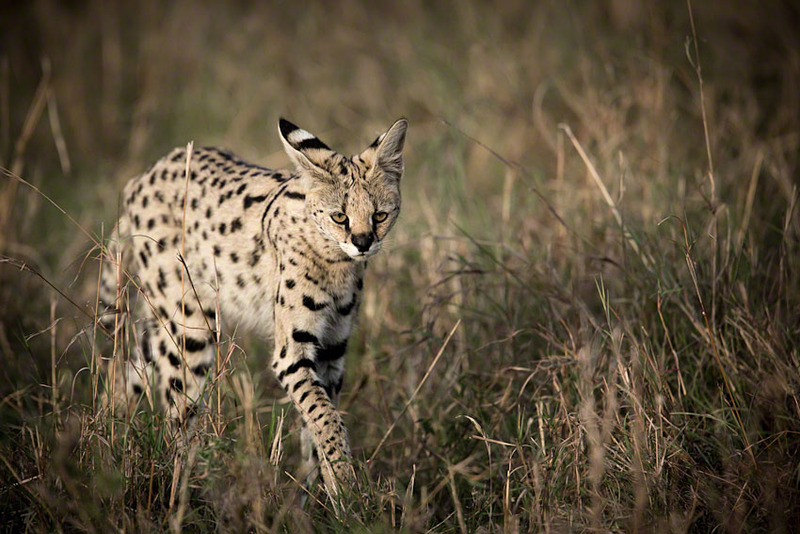 The ever elusive leopard also put in an appearance, albeit briefly, but more magical still was a simply amazing sighting of the small but stunning serval (another African 'big' cat) which stalked and hunted through the savanna grass in evening light, completely ignoring about seven safari vehicles that had clustered around this uncommon sighting. The one animal that proved hardest to find was a rhino - one wouldn't have thought so given their size. I had almost given up hope but very late on our last evening drive we finally found a black rhino. He is a quite a well known old gent with an unbelievably long front horn and a distinctive 'mini' third horn. Light was very low by then and he was in a scrubby hollow so photography was purely for recording the moment not so much for art but I was extremely glad to have even seen him. My feelings at the time were tempered with the disquieting thought that this was rapidly becoming a rare sighting in Africa with the pressure that senseless poaching is having on rhino populations. 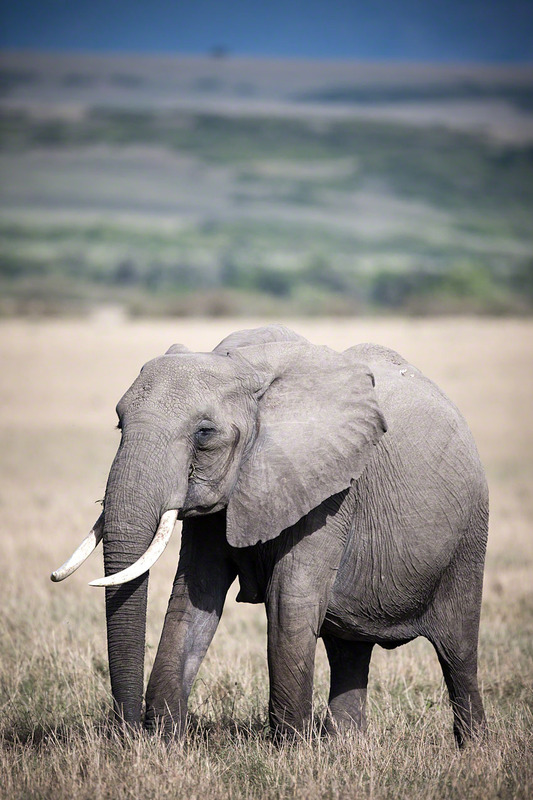 I hope Kenya's rangers are able to keep this old guy and his horn safe until he dies a ripe old age. Although we did one more short morning drive the next day before the safari ended, it was really wrapped up for me in that rhino sighting.